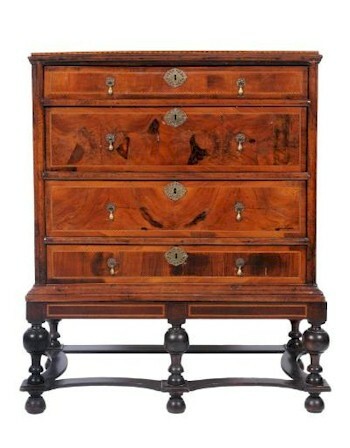 Bearnes Hampton & Littlewood include items of walnut furniture in their quarterly fine auctions and in their weekly sales of antiques and collectables. An antique walnut and inlaid rectangular chest on a stand (FS17/800), typical of the 18th Century walnut furniture appearing in our antique furniture auctions, fetched £520. The walnut tree (Latin name Juglans Regia) was widely used in furniture making, principally in the second half of the 17th century and the early part of the 18th century. Its use followed the period leading up to the death of Oliver Cromwell in 1659 (which had been characterised by its no frills, plain and basic designs) and the Restoration of the Monarchy, which allowed new ideas to flourish. Walnut was particularly suited to turnings, twists and curves as on the cross-grain, it was less likely to chip than the more porous oak. This early 18th Century walnut veneer and feather banded bureau (FS17/806) realised £720 in a fine furniture auction in January 2013. Whilst basic furniture continued to be made in oak, walnut was often used as veneer, giving furniture a much lighter appearance. Charles II carved walnut and canework armchairs are of particular interest when they appear at auction, often with tapistry in addition to the cane panels. 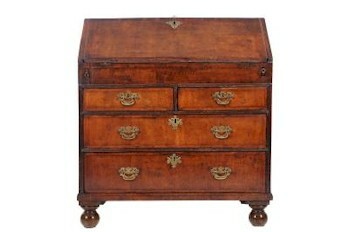 Walnut was also useful as a base wood for marquetry work, mainly in floral designs. Cabinets and escritoires are often found with floral marquetry decoration, whilst smaller items include lace boxes. 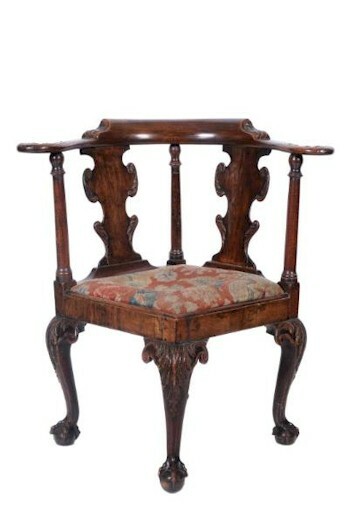 An 18th Century carved walnut corner elbow chair, decorated with acanthus leaves and flowerheads, attracted a winning bid of £3,500 at auction (FS17/801) in our January 2013 Fine Sale. The era of walnut furniture encompassed the age of Samuel Pepys, with the Pepys bookcase now being of great interest to furniture collectors. Examples of this particular design of bookcase can be found at Magdalene College, Cambridge, along with the Pepys library bequeathed to the college following his death in 1703.